Published: Sept. 8, 2018 at 03:14 p.m.
Football fans in London gather at Piccadilly road to celebrate the kickoff of the 2018 NFL Season! Take a look at some of the best moments, featuring cheerleaders, fans, Network shows and performances across the pond. 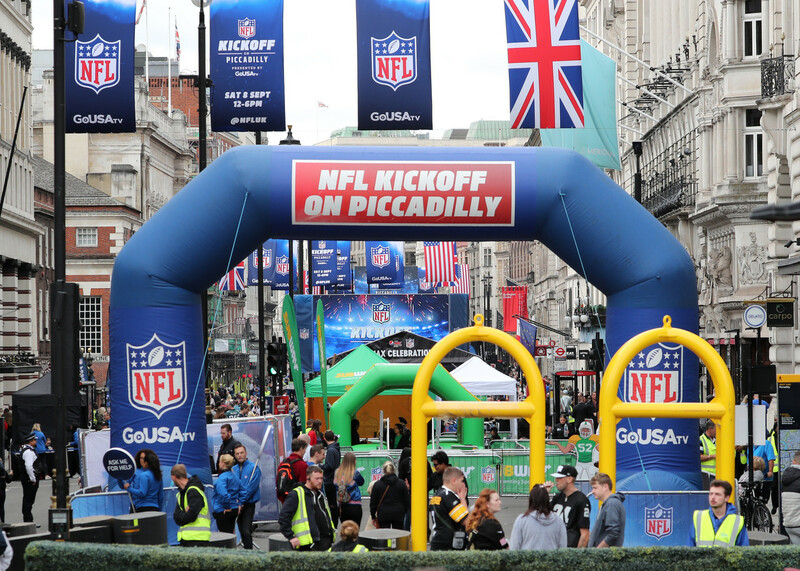 London's Piccadilly is shut down to traffic to celebrate the start of the NFL season with NFL Kickoff on Piccadilly. Philadelphia Eagles fans at Piccadilly to celebrate the start of the NFL Season. New York Jets cheerleaders perform on stage for fans at the NFL Kickoff on Piccadilly. Seattle Seahawks fans at Piccadilly to celebrate the start of the NFL Season. A general view of fans on the NFL Kickoff event on Piccadilly. A Dallas Cowboys fan at Piccadilly to celebrate the start of the NFL Season. Football fans pose in jerseys from the Jacksonville Jaguars, Seattle Seahawks, Philadelphia Eagles, Los Angeles Chargers, Oakland Raiders and Tennessee Titans at Piccadilly to celebrate the start of the NFL Season. A Los Angeles Rams fan and Jacksonville Jaguar fan at Piccadilly to celebrate the start of the NFL Season. Oakland Raiders fans at Piccadilly to celebrate the start of the NFL Season. The Around the NFL Podcast featuring Neil Reynolds (left) and Darren Fletcher (right) addresses fans on stage to celebrate the start of the NFL season with NFL Kickoff on Piccadilly. Otto the dog wearing a Cleveland Browns jersey in London Piccadilly to celebrate the start of the NFL season with NFL Kickoff on Piccadilly. The Jacksonville Jaguars drumline on stage in London's Piccadilly during the NFL Kickoff on Piccadilly. Former Super Bowl champion Osi Umenyiora and current British sports pundit hosts on stage at the NFL Kickoff on Piccadilly. New York Jets Cheerleaders perform on stage during the NFL Kickoff on Piccadilly. Minnesota Vikings fans at Piccadilly to celebrate the start of the NFL Season. Former NFL quarterback Ron Jaworski rallies fans on the mini-pitch during the NFL Kickoff on Piccadilly. A Seattle Seahawks plays in the Subway ball pit to during the NFL Kickoff on Piccadilly. English international cricketer Jason Roy attends the NFL Kickoff on the mini-pitch. Jacksonville Jaguars Cheerleaders perform on stage during the NFL Kickoff on Piccadilly. Jaxson de Ville, The Jacksonville Jaguars mascot and Swoop, the Philadelphia Eagles mascot race on the mini pitch during the NFL Kickoff at Piccadilly. A Minnesota Vikings fan cheers at Piccadilly to celebrate the start of the NFL Season. The Around the NFL Podcast team (from left) featuring Dan Hanzus, Greg Rosenthal, Chris Wessling, and Marc Sessler on stage during the NFL season with NFL Kickoff on Piccadilly. Troy The Magician interact with fans on stage during the NFL Kickoff on Piccadilly. James McVey of The Vamps performs on stage during the NFL Kickoff on Piccadilly. Brad Simpson of The Vamps performs on stage during the NFL Kickoff on Piccadilly. The Vamps perform on stage to celebrate the start of the NFL season with NFL Kickoff on Piccadilly.